My new bike sitting at the former owner's home in Virginia. For years I've liked the comfort and luxury of Goldwings. I never really gave much thought to getting one. They seemed big, expensive, and more bike than I needed. In 2006 I upgraded from my Shadow to a Nomad as I started seeing the virtues of a bigger road bike. Also, that year two of the guys I work with bought Goldwings. They had many good things to say about them and it made me more interested in them. A couple things they brought to light were the Goldwing's power and handling. I assumed a Goldwing would be a heavy pig of a bike, but the newer Goldwings have a low center of gravity and excellent handling. Good handling is something my Nomad doesn't have...it's an oinker at low speeds, especially 2-up. My riding buddy Mike plans to get a Goldwing and his enthusiasm has been rubbing off on me. When we went on our Asheville trip there was lots of discussion of Goldwings and I began noticing them more. Goldwings are also a popular bike on the internet forums I read. It's a popular upgrade from the Nomad. It's also a popular bike for long distance riders and, of course, touring. On our Asheville trip I saw some orange Goldwings which I really liked. The first was my co-worker (a different Mike) gave me the keys to his Goldwing and I took the bait. They always say not to test drive a Goldwing unless you're gonna buy one, and now I know why. The Goldwing is a sweet machine! Lots of features, power, and handles great!! The handlebars even seem comfortable to me and I'm an apehanger guy. The foot positioning took some getting used to. I can honestly say if my Shadow was still my main bike I would have went right out and bought a new Goldwing. The second thing in my decision to get a Goldwing, oddly enough, was my John Deere riding mower. When I bought my house I bought an old, used Wheelhorse riding mower. It served me well for over 10 years but eventually I replaced it with a John Deere X475 that I got practically brand new (32 hours and not a scratch on it) at an auction for half the price of a new one. The new mower is luxurious...23hp, hydrostatic clutch, hydraulics, comfortable seat, power steering, water-cooled, smooth riding...you get the picture. I actually look forward to mowing the grass now. It made me wish I'd gotten a John Deere years sooner. I was mowing one day (and loving it) when it occurred to me there were parallels between the John Deere and the Goldwing I'd been thinking about. Both are luxurious and top-of-the-line. If I wanted a Goldwing I should get one instead of pondering it for years only to wish I'd gotten it years earlier like I did the John Deere. Life is short (Each man's life is but a breath...Psalms 39:5). 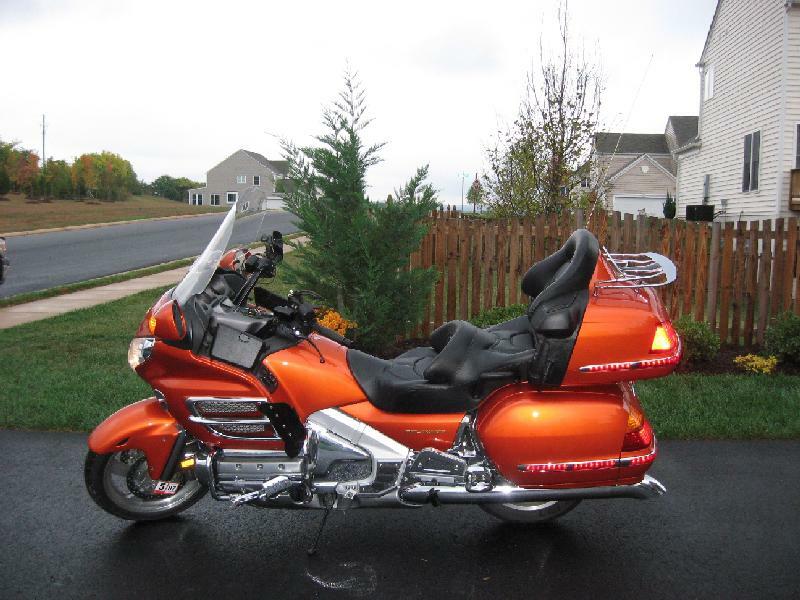 - 2002, 2003, or 2007 orange Goldwing. The 2002 orange is my favorite. Blue is my second choice, followed by black or a bright silver. - ABS and maybe even an airbag on a 2007. - Lower mileage and in good shape. - Some add-ons would be nice. Less to add myself. 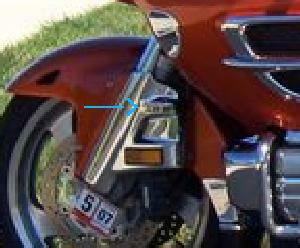 For a Goldwing I lean more towards functional upgrades as opposed to chrome. A couple times a day I would check Ebay, Cycletrader.com, and the For Sale sections at GWRRA.org and GL1800riders.com. One day I found an orange 2002 on Cycletrader. It wasn't advertised as ABS but a very close inspection of the pictures revealed 'ABS' on the front wheel covers. I sent the seller a message through Cycletrader asking for more information. A few days later I returned to my desk at work to prepare to leave for our Gatlinburg trip when I saw I had voicemail. The seller had called me. The bike did have ABS and his description sounded good. I returned his call and left voicemail telling him I would take the bike if it was still available. The next day (October 4, 2007) my girlfriend and I were slowing progressing through Pigeon Forge, Tennessee traffic when my phone rang. The seller, Kaya, was on the line. We discussed the bike for a while and I told him I would take it. He said it was mine. Yes! I was on vacation and now I had a trip to plan to get my new Goldwing!! A few weeks later Operation Get Goldwing was undertaken and I had a new (to me) Goldwing! Kaya, the former owner, and my soon-to-be bike. I am very excited about the bike. There wasn't a scratch on it. We spent several hours riding around Sunday after we got back. The bike is amazing. It's like a big, cushy electric scooter. Tons of power, handles wonderfully, quiet. I can't even tell I have a passenger back there. I can see how people ride several hundred miles a day. When I got the bike home and rode it for awhile I noticed two problems. First, the clock would reset every time the key was turned off. Second, the bike wouldn't go into reverse. I decided to tear into the bike to solve these problems. It would give me a chance to see how the bike works. I'll also do some upgrades and preventative things since it's torn apart. Some are shown below. The clock reset problem was simple. My guess was a problem with the battery backup wire. A little searching revealed the battery backup wire to the guage panel had come loose from a connector. It had had a jumper cable added in the same area so it might have came loose then. I reinserted it and things were working good again. The reverse problem wasn't so easy to find. The reverse system is complicated and I spent a lot of time studying the system and troubleshooting. 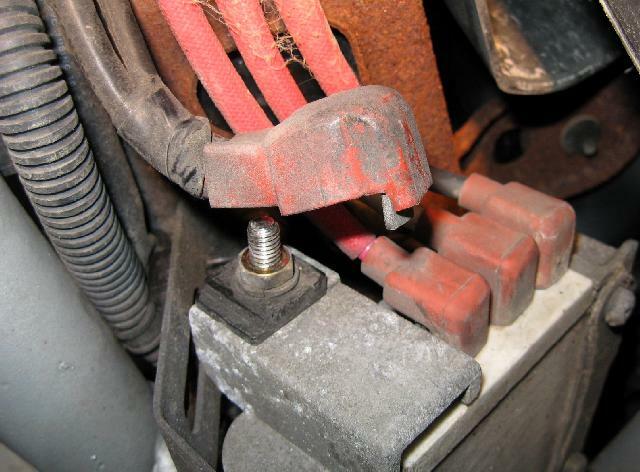 In the end it was simply a loose connection of the power wire for the starter in reverse. In troubleshooting the problem I broke the stud on the reverse switch (they break easily) and had to order a new one. I also discovered the adjuster on one of the reverse cables was broken and had to order one of those, too. Fog light wiring mod - allows the fog lights to be on with the headlights. Silver Star bulbs - while I had the front fairing off for the fan reversal project I replaced the headlight bulbs with Sylvania Silver Star bulbs. Update: On our 2009 Pigeon Forge trip both bulbs burned out within a couple hours of each other. I replaced them with normal bulbs. 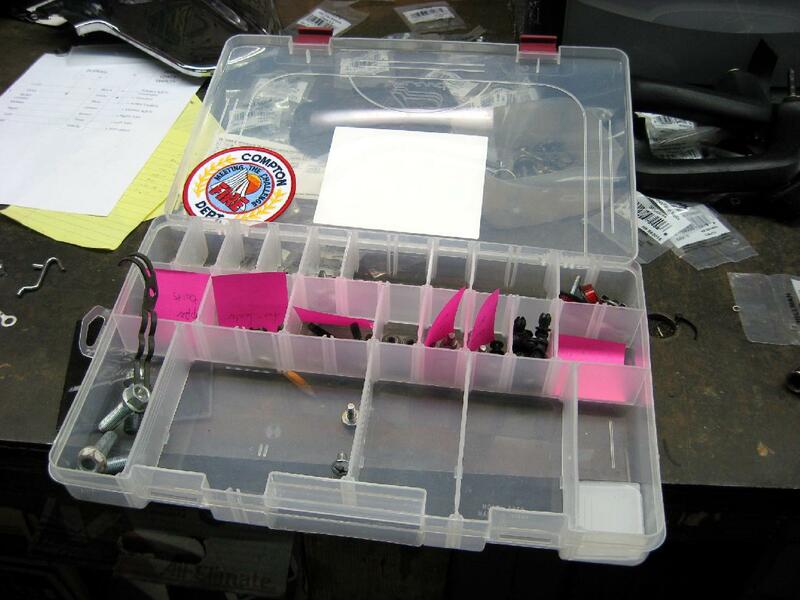 Parts tray - a good way to keep track of your parts when you tear into the Goldwing. Car tire - going to the Darkside. New taillights - and a little defarkling. Bike rebuild - thanks to a drunk driver. Integration of the GL2Way with a second radio and installation of Kennedy FRSet4. GROM radio integration kit - replaced my BikeMP3 player. 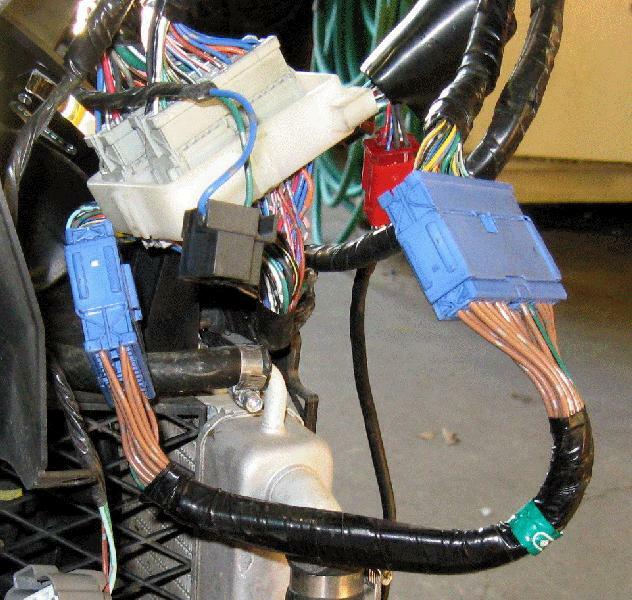 Updates I'd like to see on a Goldwing. 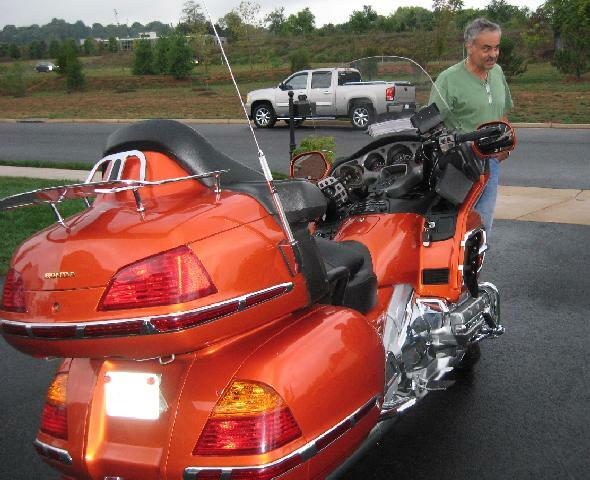 Fred Harmon's site - a huge source of Goldwing information and instructional videos. GL1800 Riders - the largest Goldwing forum on the net. The GL Forum - up and coming Goldwing forum. 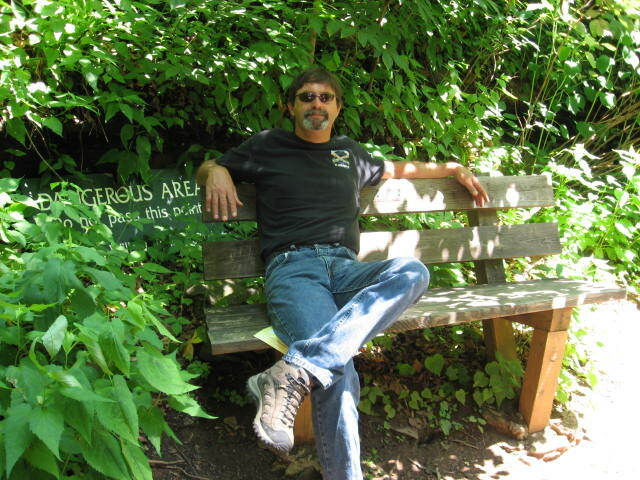 Steve Saunders Goldwing Facts Site - lots of good how-to's. 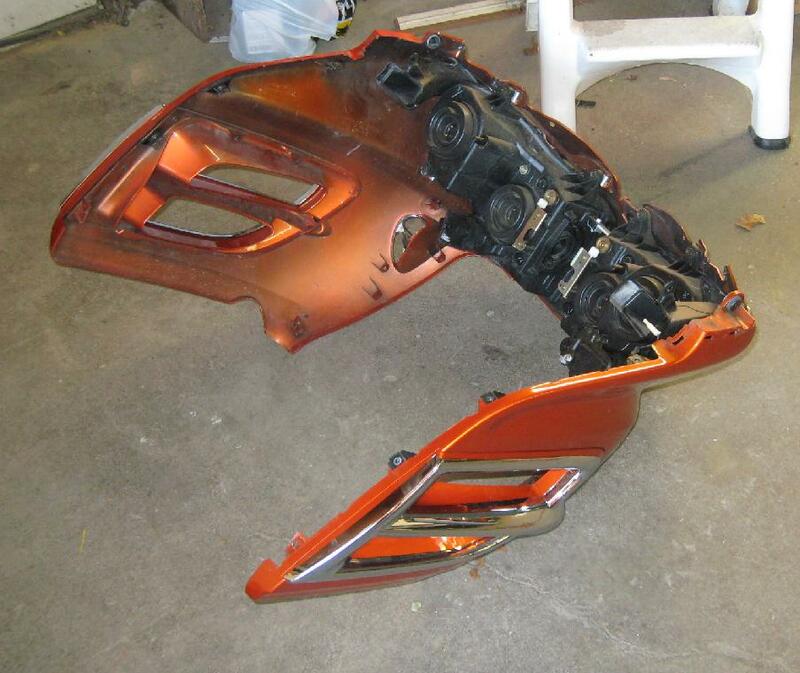 Wingstuff - a great source of Goldwing parts. Shinhopples - Another source of Goldwing parts. Cyclemax - Another source of Goldwing parts. Goldwing colors and info by year - Good info if you're shopping for a used Goldwing.